Hands down, one of my frequently asked questions in my Bread Machine Garlic Bread Pizza Dough Recipe is why my recipe doesn't call for sugar with the yeast. There are so many new yeast options out there and they all work a bit differently than the old classic yeast you may be familiar with. 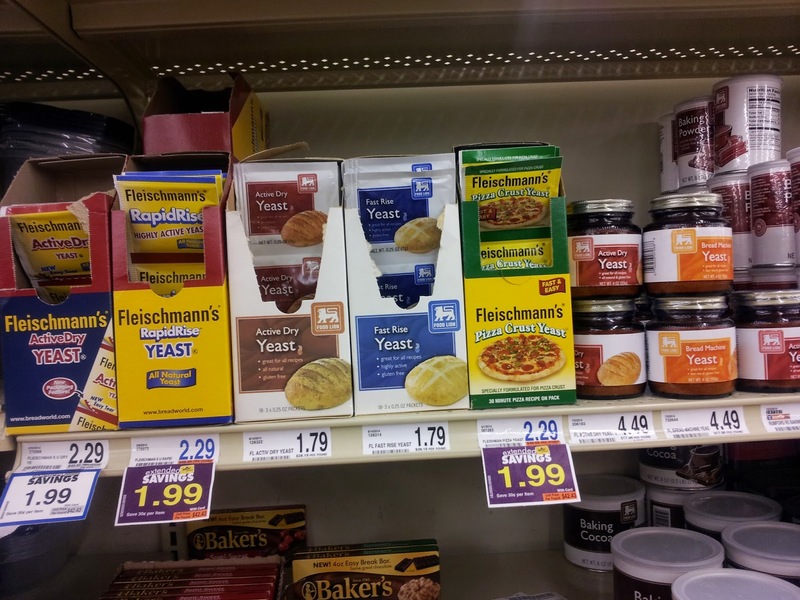 So, what is the difference in all those yeast products and how do you choose which one to use in your baking? Old Fashioned Cake Yeast: This is nearly impossible to find anymore but those that use it, LOVE it! (moist) - IT has the traditional live yeast cultures. It needs to be dissolved in water. Active dry - This is the yeast you probably remember as "classic" yeast. It is the traditional dry yeast. It does need to be dissolved in water and usually with a bit of sugar to activate the yeast cultures. This yeast has really been the "gold standard" of yeasts for years. It is very consistent in its labeling among manufacturers, and in its performance if you activate it properly. The main problem with these yeasts is that there is no consistent labeling among manufacturers and even a single manufacturer often uses the same kind of yeast labeled different ways in different packages and commanding higher prices for some, even though it is the same yeast. For example little packets of "pizza" yeast will cost you more than it does when you buy a jar of "bread machine" or "instant" yeast, even though it is usually the exact same yeast. Uses: For bread machine users, and recipes that only require a short amount of rise and bake time, (such as pizza dough). 1) No need for sugar: These new instant yeasts do not need sugar to activate the yeast cultures, they contain a little bit of yeast enhancers, (usually citric acid) that work in place of sugar. Rapid Rise: Basically this is usually Instant yeast with a larger amount of yeast enhancers, and also can have a change in the granules. This type is meant to work very fast, and can be used in recipes that will be done in an hour or so. Con's of Rapid Rise For people wanting to bake more artisan breads that require a slower rise time, do not use rapid rise yeast. For making by hand, use active dry yeast, for your bread machine use the Instant/Bread Machine yeast. Beware: Because there is no consistent labeling, some manurfacturers may actually interchange the meaning and labeling of Instant/Bread Machine and Rapid Rise. If you are an experienced bread maker, you already know, love and use regular active dry yeast. No need to change that for any reason what so ever. There is a place though for the newer instant yeasts. For those of us that use a bread maker, or make an occasional batch of pizza dough in our Kitchen Aid Mixer , the Instant Bread Machine yeasts will work just fine! 1) Avoid Rapid Rise: I recommend avoiding the rapid rise all together. The Bread Machine /Instant yeasts will work just fine without the increased concentration of rising enhancers. 2)Buy your yeast in jars not packets. Besides being more expensive, they often are packaged just too tightly and can effect the performance of the yeast. 3)Store in fridge or freezer: Will help the yeast stay fresher longer. 4) Stick with the same brand: once you find one you like stick with it, it will lead to consistent results.